Posted 1 year ago on Thursday, December 21st, 2017 by James S.
The Mustang had about 118,000 miles on it at time of purchase, which meant it was nearly due for a differential oil change. 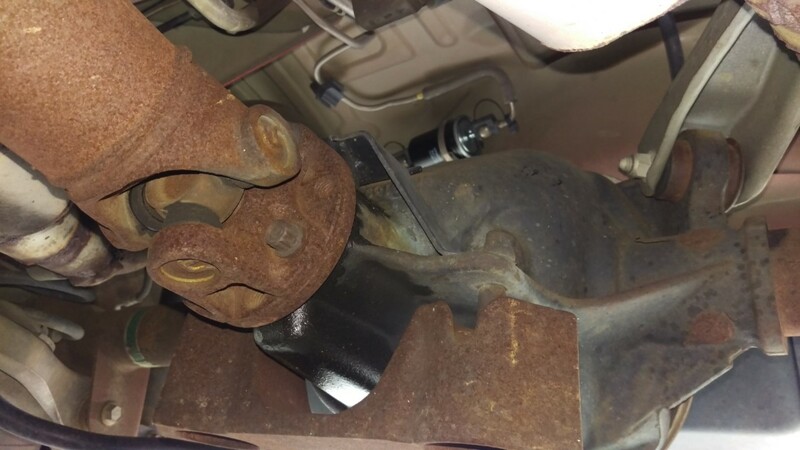 94-04 Mustang rear differential oil replacement should be done about every 60,000 miles. 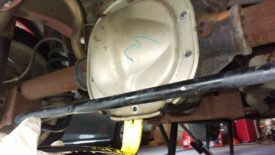 This is true for any other Ford 8.8″ differentials, which are extremely common in Mustangs, F-150s, and other vehicles. 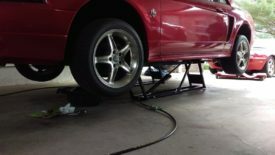 The job is fairly easy, although Ford did not include a drain plug, making it slightly more difficult. 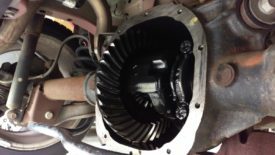 (Optional) Replacement differential cover with drain plug – This makes replacing the fluid easier, as you can just remove/replace the drain plug. I didn’t think the expense was worth it. The first step is to get the car in the air. 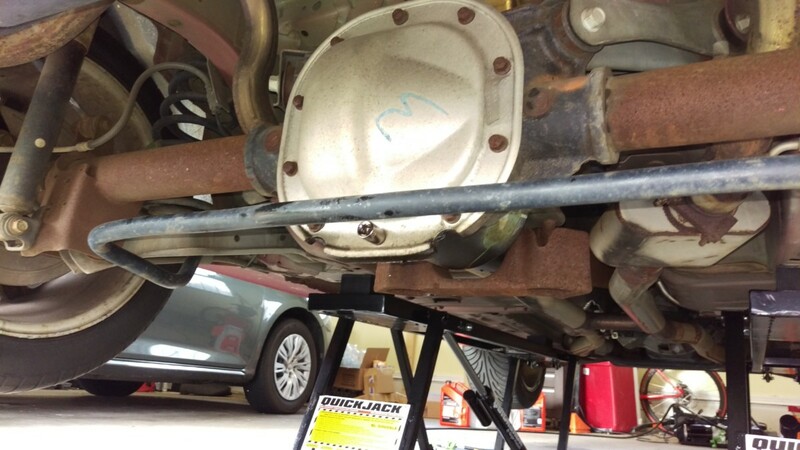 To maintain access to the differential, I’d use a floor jack on the differential itself and then place jack stands under the point where the LCA meets the body. 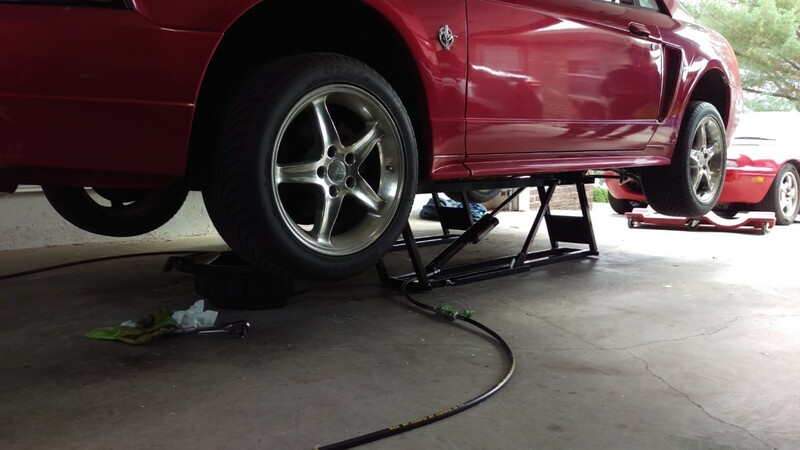 Fortunately, I have a Quickjack BL-5000SLX , so I lifted it as shown. 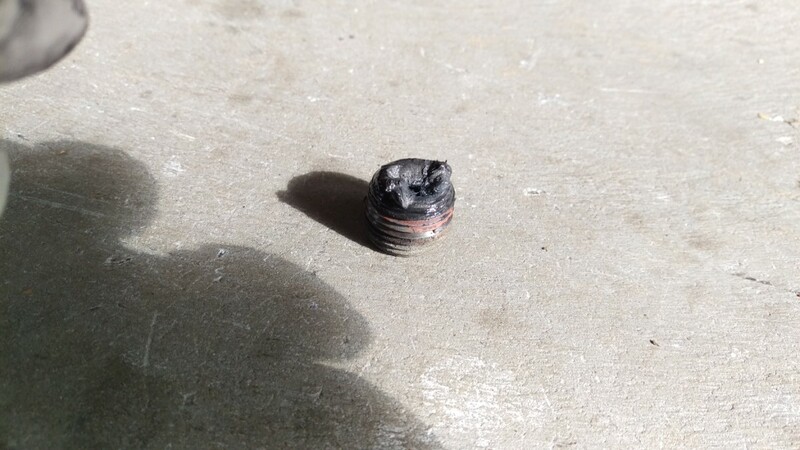 With the car in the air, the first thing to do is make sure you can remove the fill plug. 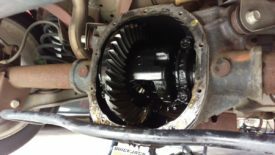 If it’s too stuck to remove, you want to find out before you empty the differential of oil, so the car is at least still drivable. 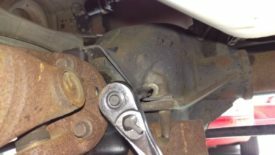 In a typically odd Ford fashion, the fill plug has a spot to take a 3/8″ ratchet and extension directly as shown, with no socket on it. The fill plug may have a bunch of metal shavings on it, especially if the differential has been neglected like this one probably was. The plug itself has a magnet to attract shavings, in order to keep them out of the diff. 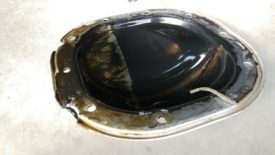 You’ll want to clean this gunk off before reinstallation. Mild application of a degreaser or brake cleaner and a rag clean it right up. You’re now ready to drain the differential. Since there is no drain plug, you’ll have to simply unbolt the cover. Before grabbing the wrench, place a pan or bucket underneath to catch the oil that will pour out. 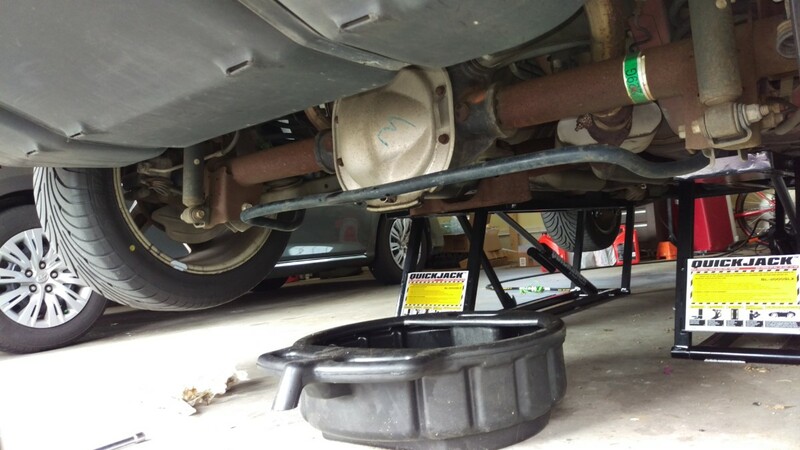 With the pan in place, you can begin loosening the bolts holding the cover to the differential. I don’t remove them all at first. Instead, remove the lower 7 bolts, leaving the top 3 loosened but still in place. Then, using some kind of pry bar , pull the bottom of the cover away from the differential. As soon as the seal from the old RTV breaks, the oil will pour out. 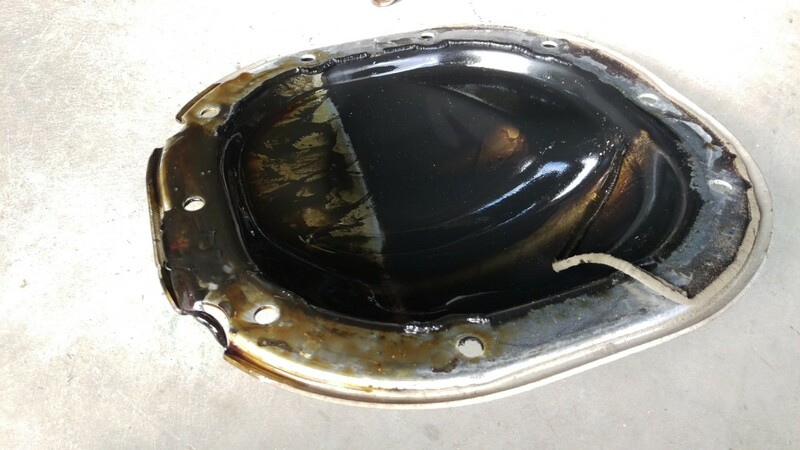 Once the majority of the oil has come out, you can remove the final 3 bolts and pull the cover off. 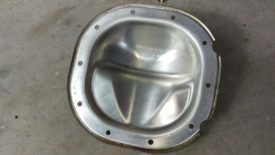 The cover itself will have a bunch of dirty grease on the inside, which can be cleaned before reinstallation to ensure it seals properly. This also goes for the surface around the differential, which will have residue from the old RTV on it. 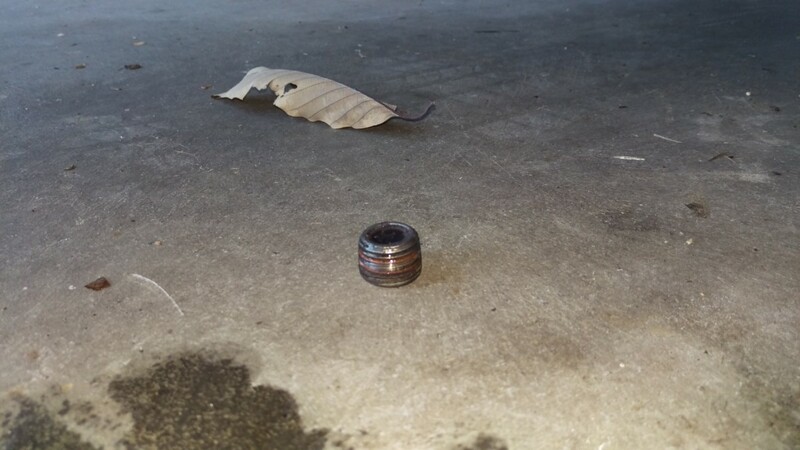 To clean the mating surface on the differential, I simply scraped it with a plastic gasket scraper . Most people use a regular metal gasket scraper, but I find that I end up gouging surfaces that way. The plastic scraper is physically incapable of gouging anything. 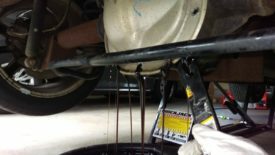 I also used a little bit of brake cleaner and a rag to get rid of any remaining residue. I believe some people will also clean the differential internals and gears at this point, but I didn’t feel comfortable touching it, so I left it alone. 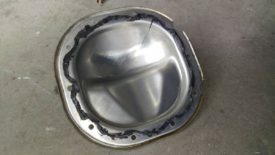 If you chose to get a replacement cover with a drain plug , you can skip cleaning the old one and move on to the next step. I didn’t have $175 to burn, so I kept my original one. 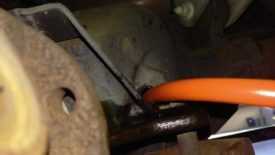 The replacement cover allows simply unscrewing a drain plug to drain the oil, though, making this job easier the next time. The cover needed a heavy application of brake cleaner , but it cut through the grease like a hot knife through butter. I probably got it cleaner than it needed to be, but that doesn’t hurt anything. 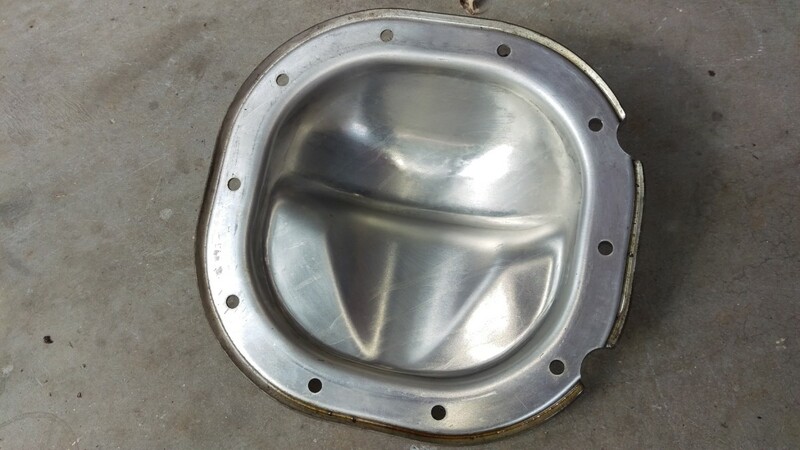 Once everything is clean enough, the cover can be reinstalled. First, a 1/4″ or so bead of RTV goes around the edge of the cover as shown. There needs to be enough to give a good seal, but there’s no point in making a huge mess. You also do not want chunks of RTV circulating inside the differential. I use Permatex Ultra Black for everything RTV-related. I’ve found it cures the fastest, sticks the best, and never leaks as compared to the other colors of RTV. Once the cover is ready, gently place it against the differential and begin putting the bolts back in. I put the bolts on in a star pattern, like you would tighten lug nuts. This means start with, say, the top bolt. Tighten that one, then the bottom, then the left side, then the right side, etc, moving across the cover to the next bolt to tighten it evenly. This will prevent leaks. I do not fully tighten it immediately. Instead, I snug them down to maybe 15 lb-ft at this point and give the RTV a half hour or so to set up a bit. Then, I use a torque wrench and torque the bolts to 25 lb-ft in the same star pattern. 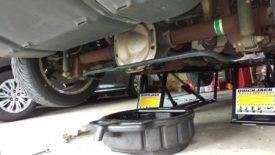 I waited until the next day to refill the differential, just to make sure the RTV set. This probably isn’t strictly necessary, especially with the fast cure time of Ultra Black. I would still give it at least a couple of hours, though. I used this style of fluid transfer pump , which I’ve found to pump fairly fast. 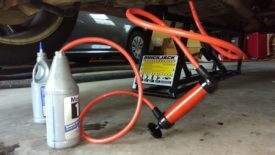 In the past, I’ve used one of these instead , which I really liked because it screws into a Mobil-1 quart-sized bottle. However, it seems more fragile and broke fairly easily. Either way, the goal is to pump the first quart of fluid into the differential. Once that’s done, you can add the friction modifier one of three ways. 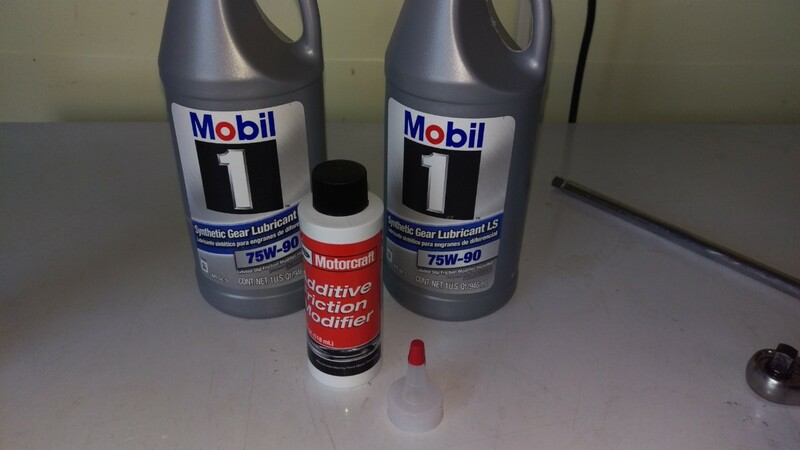 Either add it to a partially-empty bottle of gear oil and use the pump, use the pump directly on the friction modifier bottle if you can, or try to pour it directly in the fill hole. It’s a smaller bottle, so direct pour may work. The easiest is to add it to one of the quart-sized bottles when they’re partially full. 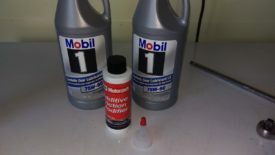 Either way, add the modifier and the second quart of oil. Once that’s done, put the fill plug back in. I didn’t bother with a torque wrench, but just snugged it down reasonably tight. And that completes the job.